Happy Glitter Me Up Friday! This week I had an overwhelming number of polishes arrive from blog sales, prizes and indie buys. I'm still trying to swatch and catalog them all and just couldn't decided which to wear for Friday, so I made my own again :) I love creating polishes, I just rarely bother wearing them when I'm done. For me the fun is in the mixing. So I set myself the challenge of creating a glitter polish I liked enough to wear. My desk is home to a host of mini bottles which I use for testing glitters and pigments. Each bottle is half full of a mix of suspension base and clear polish with a scoop of whatever I'm testing. I leave them in there until I run out of bottles. I think I have around 100 bottles which means most glitters have about a month of testing for bleeding, melting and discolouration before I need to rinse out the bottles. Actually my husband does the rinsing part for me so I don't have to ruin my manicure with acetone :) I've found thinner works better for cleaning out the bottles but bulk acetone is cheaper. Hubby not only gets the bottles and brushes sparkling clean, he also saves and scrubs the SS balls for me (yep I use balls in my test bottles). 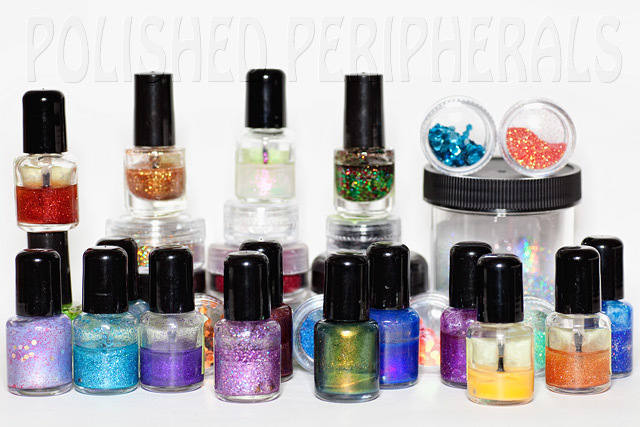 Anyway when I get to the need to empty bottles stage I often take the successful bottles, those with glitter that hasn't bled etc and either add more glitter, pigment and base to them to make a mini polish or I decant a handful of them into a full size bottle for a random mix. Then I usually stick them away in a drawer and forget all the ingredients. The fun is over for me once the bottle's full. 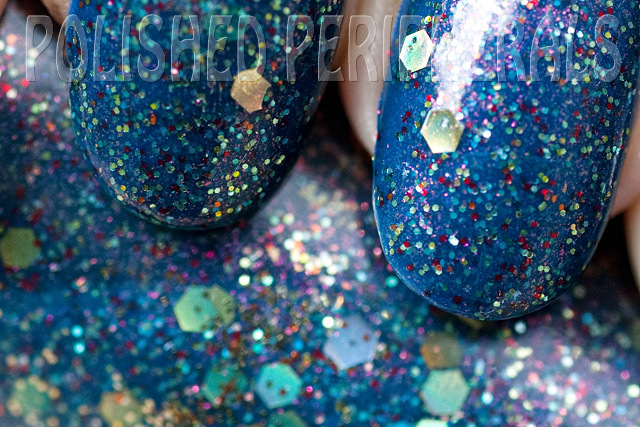 This Friday glitter is one I've thrown together from a bunch of test bottles. I love the surprise results from these random mixes. There's glitters in gold, holo gold, blue and shimmery orange and purple with blue, green, yellow, black and colour shifting pigments. All random quantities mixed together, then more pigment added until I came up with a nice grungy denim colour. I wanted a glittery mess with enough pigmentation to be opaque in 2 coats without smothering the glitter and it had to sit flat without being all rough and lumpy. This is with coat of Seche Vite over. Smooth, shiny, sparkly and deeply pigmented. Yep I can wear this one :) I probably wont though, it will end up in the test drawer with the other bottles I don't have recipes for. This is a 13ml bottle. It was almost full at one stage but I test a lot on nail wheels while mixing, after each addition of pigment, and then 2 coats on my nails and this is all that's left. love all your little bottles in the top pic with heaps of different polishes you made. can i ask....where do you purchase your glitters etc from??? could you email me on osirisandloki at gmail dot com. thanks!